Do you give your Mercedes-Benz a real workout? Drive towards better value with Mercedes-Benz’s unique Service C.
Mercedes-Benz service packages can be tricky to navigate and comprehend. Service A, B, A1, B3, D, G… the list goes on and on. Even some dealers have a hard time wrapping their heads around it! If your maintenance display is showing service C or some other combination of letters and numbers, your Mercedes-Benz has Service ASSYST. The service required will either be a small scope service (Service A) or a large scope service (Service B), with one or more additional items. Does your vehicle have Service ASSYST? If so, get in touch with Ammstar today; we will help translate your service requirements! What’s included in Mercedes-Benz Service C? A seemingly simple question, but the honest (and somewhat ambiguous) answer is that is truly depends! The Service ASSYST usually takes the form of a small scope (A) or large scope (B) service, but with a few additional items bundled. You may drive an E Class cabriolet, an efficient A Class hatchback, or even a GClass with 4MATIC. Each contains unique systems and parts tailored for the drivers and purposes it was designed for. As such, what’s included in Service C will depend on the exact model you drive. The local mechanic probably doesn’t know what Service C involves for your specific model. But the specialist technicians at Ammstar do! Some use their cars locally with several short trips, while others accumulate kilometres quickly with constant freeway driving. How you use your car determines what service items you need – this is service ASSYST! While some items are time based like brake fluid which is replaced every two years, regardless of kilometres, others have a maximum kilometre limit. Whether you need these services performed depends on how much you drive. Do you use your vehicle for work? Do a lot of country driving? Talk to an independent Mercedes-Benz expert to find out exactly what your vehicle needs. While you may not be driving from Melbourne to regional Victoria every week, there are some services that will need to be performed by time, rather than kilometres. Your transmission for example, has hundreds of individual components that all rely on a special hydraulic oil for correct operation. Over time, moisture from the air can enter the transmission. Your brake fluid for example is a substance that attracts and absorbs water. Over time moisture from the air can enter the system, reducing your brakes effectiveness. In extreme cases this can lead to brake failure. It is therefore recommended that the brake fluid change is performed every two years, regardless of the distance travelled. Fuel filters, coolant and transmission services all have a maximum time limit which varies between vehicle models. Tell your corner mechanic that your Mercedes has notified you that it needs a Service C, and they might scratch their head in confusion. We don’t blame them – the official Mercedes-Benz service booklet can appear like a mess of tables, charts, and services. If cars baring the 3-pointed star only make up a small minority of the vehicles they service, they might not even realise that your Mercedes requires deeper servicing. 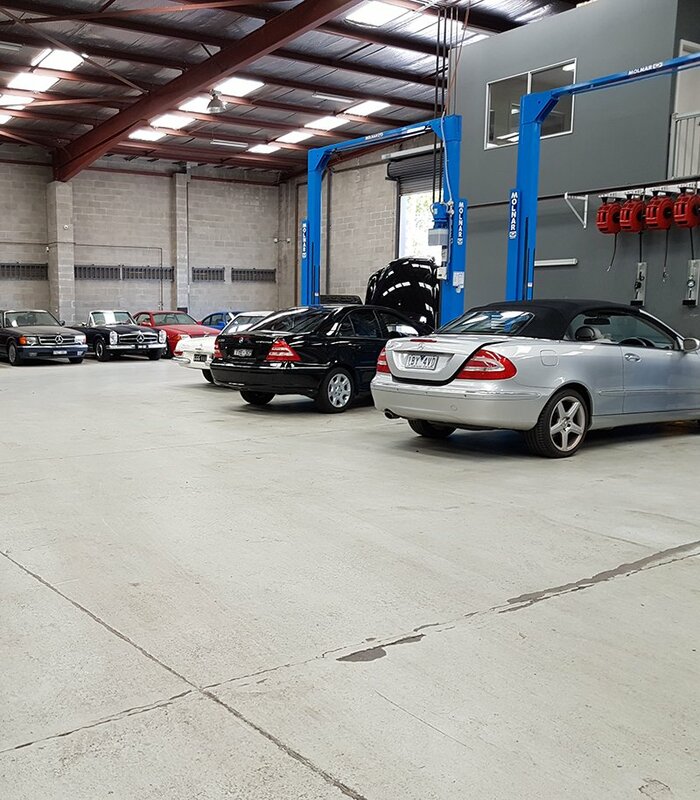 Ammstar’s Mercedes-Benz specialists offer an affordable alternative to dealership service for residents across Melbourne, with independent services centres in both the north and Bayside regions of the city. If your dashboard starts telling you that you need Service C, you know who to ring.